Daniel Higginbotham has been a professional programmer for 11 years, half of that at McKinsey & Company, where he used Clojure to build mobile and web applications. 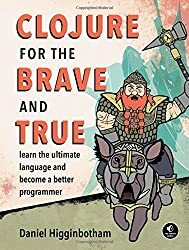 He has also contributed to the curriculum for ClojureBridge, an organization that offers free, beginner-friendly Clojure workshops for women. Daniel blogs about life and programming at http://flyingmachinestudios.com/, and can be found on Twitter, @nonrecursive. He lives in Durham, North Carolina, with his wife and four cats.